Should you require surgery, comfortable waiting rooms for your family are located near the surgery suite, and a hostess is on duty to keep them informed of your condition. Cafe Baptist Health is located in the basement. Breakfast: 6 a.m. – 9:30 a.m. Lunch: 10:30 a.m. – 2 p.m.
Dinner: 4:30 – 8:30 p.m. Vending machines, available around the clock, are located across the hall from Cafe Baptist Health. The Coffee Shop is located near the lobby by the Main Entrance. Monday-Friday: 6:30 a.m. – 10 p.m.
Saturday-Sunday: 8 a.m. – 1 p.m. Parking for visitors is conveniently located in lots near the hospital’s Main Entrance. The lots are well lit and regularly checked by the security staff. However, Baptist Health is not responsible for damage to vehicles or property stolen from cars parked on the lots. Free valet service is also available to all patients and visitors at our Main Entrance from 7 a.m. – 5 p.m., Monday – Friday. 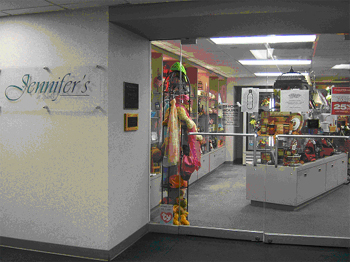 Jennifer’s at Baptist Health is a full-service gift shop open seven days a week. It is operated by the Baptist Health Auxiliary, a volunteer group dedicated to improving Baptist Health System and the community’s health. You are welcome to place your order by phone, and we will help you customize your gift. We are open 8 a.m. to 7 p.m. Monday through Friday, 9 a.m. to 6 p.m. on Saturday, and 1 p.m. to 6 p.m. on Sunday. Our telephone number is (479) 441-4221. Please be aware… Patients in ICU cannot have flowers or gifts. Some other health limitations may prohibit flowers. Located at Baptist Health System, 1st Floor, 1001 Towson Avenue, Fort Smith, AR 72901, (479) 441-4221. Jennifer’s, Too! is a branch of Jennifer’s at Baptist Health. It is located in Baptist Health Plaza and operated by Baptist Health Auxiliary. Special features at Jennifer’s, Too! include coffee, soda, and tables and chairs for your convenience. We also sell a full array of gifts. Located at Baptist Health Medical Plaza, 1500 Dodson Avenue, Fort Smith, AR 72901, (479) 709-1965. Inspirations is located inside the Baptist Health Women’s Center-Fort Smith, 1500 Dodson Avenue, Suite 140, Fort Smith, AR 72901, (479) 709-6881. Baptist Health-Van Buren understands family members and friends are an important part of the healing process for our patients and we welcome you to visit. If you are visiting a patient at Baptist Health-Van Buren, please check-in at the information desk. One of our volunteers will be happy to assist you. Our patients need to get adequate rest, so please encourage loved ones to limit their visits. Children may visit only if supervised by an adult at all times. Our cafeteria is located on the ground floor and serves breakfast and lunch.